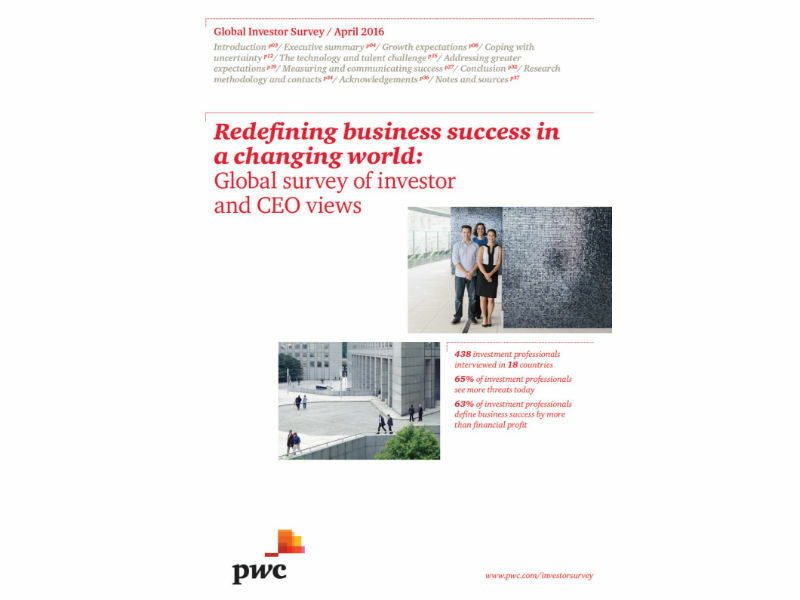 A new global survey from PwC reveals the differing views between investors and chief executives on key issues such as performance incentives, the availability of key skills and value creation. Between September 2015 and February 2016, PwC’s 'Redefining business success in a changing world' study canvassed the opinions of 438 investment professionals including buy-side and sell-side investment professionals and ratings agencies. The results were benchmarked against the views of 1,400 chief executives polled in PwC’s recent Global CEO Survey. More than seven in 10 (73%) of investors surveyed believe a company’s purpose centres on creating value for shareholders, compared to 16% of CEOs. 84% of chief executives recognise that they are expected to address wider stakeholder needs. This is also reflected in the views of CEOs (76%) and investment professionals (63%) that future business success will be defined by more than financial profit. The survey observes that the investment community are significantly more likely than CEOs to consider misaligned performance incentives as a barrier to change. The mismatch between the two camps reflects the strength of feeling in this area: almost half (49%) of investors surveyed in the report flagged this as a major concern compared to only 17% of chief executives. In the area of remuneration reporting, equity investors are particularly likely to identify misaligned performance incentives as an issue (42%, compared to 28% of fixed income respondents). This most likely reflects the tension that exists between companies and their shareholders, as well as equity capital providers’ desire to have more say on company strategy since they bear the residual risk, PwC says. "From our work with the investment community we know they tend to be sceptical of remuneration numbers. Companies clearly have more visibility into how management is remunerated than investors have from the outside. “These businesses may have to do more to link their remuneration policies and key performance indicators to overall strategy and risk management, given the number of investors who think companies need to change the way they measure success and hold themselves accountable. “Alternatively, if companies believe the link does exist, they could try to explain that linkage more clearly to their investors. “Investors have previously told us that they want to see more linkage generally in financial reporting." Additionally, nearly three-quarters (72%) of CEOs see availability of key skills as a threat to business growth compared to less than half (48%) of investment professionals. A perception gap – investors may have the facts, but do not place the same importance on them. However, there are several areas where there is common ground. Investors and CEOs both identify the same key markets – particularly the USA and China – as key for companies’ future growth. Half (53%) of investment professionals and CEOs believe the purpose of a company is to provide value for customers. The impact that technology can have on investors’ and CEOs’ lives is also reflected in both groups’ relatively high levels of concern about cyber threats to business. Six in 10 investors and CEOs are concerned about cyber threats. This concern is particularly high among buy-side investors (65%). “I’m struck by the differences of opinion our research has revealed. Investment professionals, for example, appear far less concerned about skills shortages and the threat these pose to business growth. “Investor and analyst responses suggest a desire for businesses to operate in more socially responsible ways, rather than putting financial profit generation above all else. CEOs may also be surprised to see how much attention some investment professionals are paying to wider issues related to the environment and society. “The results show where the investment community and business leaders agree and where they see things differently. We therefore encourage both CEOs and investment professionals to commit to more open and ongoing engagement for their mutual benefit. For this survey, PwC obtained feedback from 438 investment professionals: 286 responses were generated through an online survey running from December 2015 to early February 2016, and 152 through interviews conducted between late September 2015 and January 2016. Respondents included buy-side and sell-side investment professionals with both equity and fixed income interests, as well as ratings agencies. We obtained wide geographical representation, with participating investment professionals located in Europe, North and South America, Asia-Pacific and Africa. Not all figures add up to 100% due to rounding of percentages and exclusion of ‘neither agree nor disagree’ and ‘don’t know’ responses. For our 19th Annual CEO Survey, we conducted 1,409 interviews with CEOs in 83 countries. Our sample is selected based on the percentage of the total Gross Domestic Product (GDP) of countries included in the survey, to ensure CEOs’ views are fairly represented across all major countries and regions of the world. The interviews were also spread across a wide range of industries.